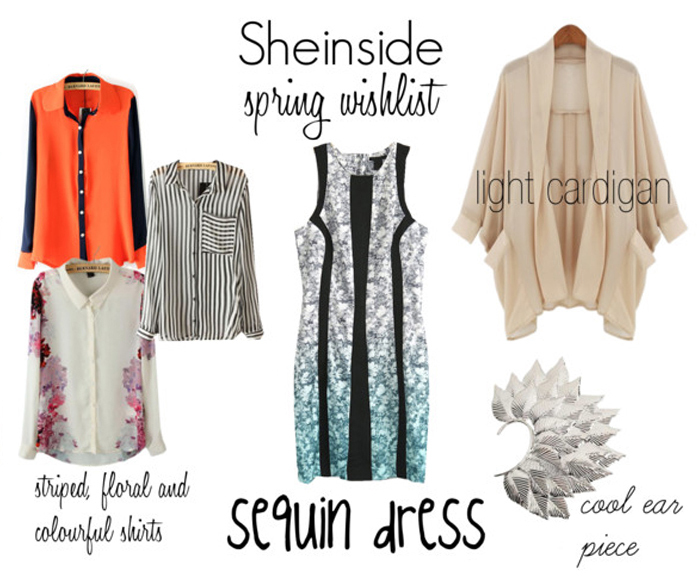 I've been collaborating with Sheinside for quite some time now, so checking out their page became quite a ritual for me. Therefor I decided to make a small collage of my favourite pieces that I believe are going to be perfect for the upcoming spring. The only thing that we need now, is for this snow to finally disappear and for bear legs to become our everyday accessory! The light cardigan is great. It's a very nice wishlist. Everything is so pretty. Perfect light cardigan. The cardigan is my favorite piece. H&M has the same dress? i really like shirts !!! The dress is really really nice! Never heard of this brand before - I will check it out! Love the ear piece and the orange shirt! I love the floral shirt! love the cardigan and the striped shirt! I think I like everything! cool items.. I love ear cuffs!! I love the sequins dress.. very chic!